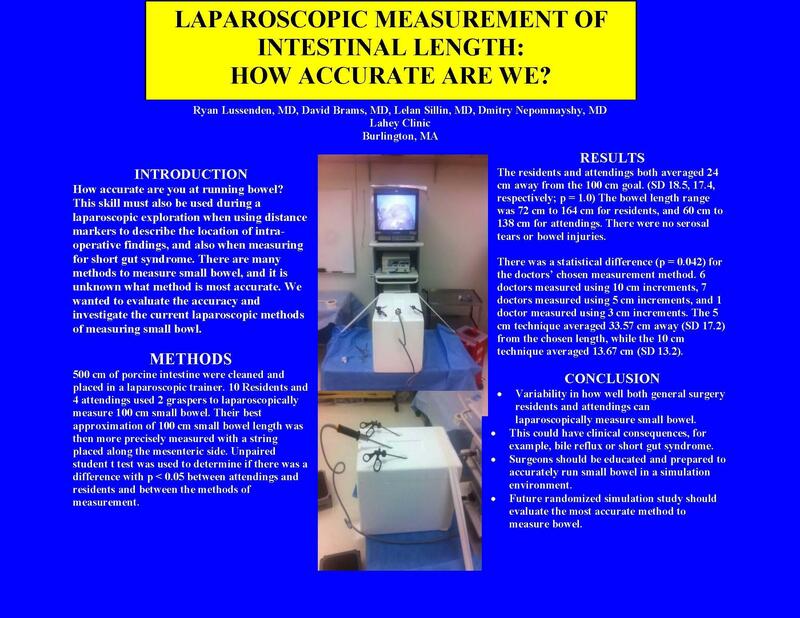 Laparoscopic Measurement of Intestinal Length: How Accurate Are We? INTRODUCTION – Many laparoscopic operations require accurate measurement of small bowel length. For example, during a laparoscopic Roux-en-Y gastric bypass, an accurate measurement of the alimentary limb should be done to prevent bile reflux or short gut. This skill must also be used during a laparoscopic exploration when using distance markers to describe the location of intra-operative findings, and also when measuring for short gut syndrome. There are many methods to measure small bowel, and it is unknown what method, if any, is most accurate. We wanted to evaluate the accuracy and investigate the current laparoscopic methods of measuring small bowel. METHODS AND PROCEDURES – Approximately 500 cm of porcine intestine were cleaned and placed in a laparoscopic trainer. 10 Residents and 4 attendings used 2 graspers to measure 100 cm small bowel laparoscopically. They were told to use their standard intra-operative methods. Their chosen incremental method that they measured the bowel was recorded. Their best approximation of 100 cm small bowel length was then more precisely measured with a string placed along the mesenteric side. Unpaired student t test was used to determine if there was a difference with p < 0.05 between attendings and residents and between the methods of measurement (5 vs. 10 cm increments). RESULTS – The residents and attendings both averaged 24 cm away from the 100 cm goal. (SD for residents was 18.5, for attendings was 17.4; p = 1.0) The bowel length range was 72 cm to 164 cm for residents, and 60 cm to 138 cm for attendings. There were no serosal tears or bowel injuries. There was a statistical difference (p = 0.042) for the doctors’ chosen measurement method. 6 doctors (3 attendings, 3 residents) measured using 10 cm increments, 7 doctors (1 attending, 6 residents) measured using 5 cm increments, and 1 doctor measured using 3 cm increments. The 5 cm technique averaged 33.57 cm away (SD 17.2) from the chosen length, while the 10 cm technique averaged 13.67 cm away (SD 13.2). CONCLUSION(S) – There is a wide variability in how well both general surgery residents and attendings can laparoscopically measure small bowel. This could have clinical consequences, for example, bile reflux or short gut syndrome. Both residents and attendings should be educated and prepared to accurately run small bowel, perhaps best taught and practiced in a simulation environment. Better techniques to run small bowel accurately need to be explored. A future randomized simulation study should be be done to evaluate the most accurate method to measure small bowel, for instance, between the 5 cm and 10 cm techniques.